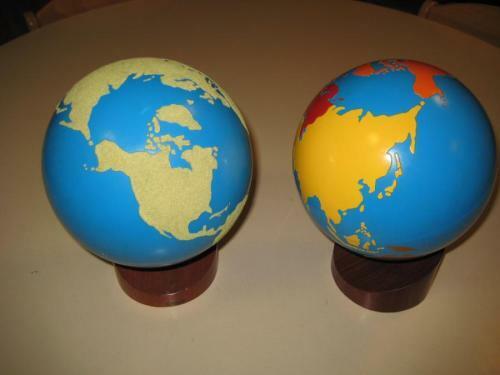 The material is an essential element of the Montessori environment. Each item carries a concept which the child unlocks and perfects as he/she discovers and experiments with the material. Knowledge is therefore not transmitted verbally from the teacher to the child, but acquired by the child through the use and handling of the pedagogical material. It is through the child’s own experience and observations that he/she will learn autonomously. Based on her observations, Maria Montessori adapted her material to the child’s needs. Therefore, the colours, sizes, shapes and types of materials were specifically selected and maintained to help the child learn as comfortably and efficiently as possible. The work carried out by means of the material always follows a precise sequence of logic with a specific aim. Therefore, a child’s activity will always have a beginning, a middle and an end, and will increase in complexity as the child advances through the material. Gradually, the child will shift from a ‘concrete’ way of learning (i.e. counting concrete objects which can be seen and touched) to an ‘abstract’ way of learning (i.e. being able to count in one’s head, without the support of objects). Each material is unique and has its specific place in the environment. It is always used and put back in a well-defined way which allows the child to self-correct his/her own work. The repeated handling of the material enables the child to develop his/her concentration, logic and dexterity. The material is divided into 4 areas. The practical life material helps a child develop his/her concentration and autonomy. Building up confidence, nurturing self-esteem and understating the surrounding environment are all things which enable a child to gradually become independent. Getting dressed, preparing a snack, helping oneself to food and water, are all things a child will enjoy doing alone. Furthermore, all these activities strengthen and refine the child’s hand and wrist movement. At a later stage, this acquired strength of grip and control of the hand makes learning to write more accessible. 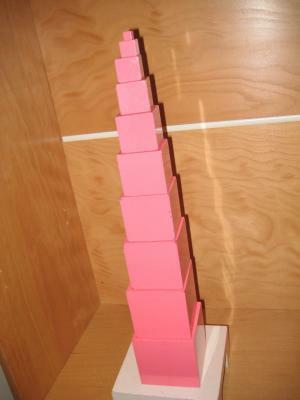 tne pink tower and constructor triangles. Learning new vocabulary, listening to stories, focusing on the sounds which constitute spoken language are some of the few ways in which a child begins to explore language. Sandpaper letters and tracing metal insets are examples of the sensorial material which guide a child towards learning how to write. The sand paper letters and metal insets. This material is mainly sensorial and was designed to gradually help discover and understand numbers and their values, the decimal system and its function in additions, subtractions, multiplications and divisions.